In the August episode of the CLIMAS Southwest Climate Podcast, Mike Crimmins and Zack Guido take a closer look at the monsoon in the Southwest. They recap the monsoon, they discuss the components that factor into monsoon precipitation patterns and the high degree of spatial and temporal variability of that precipitation, and the way the monsoon can fade or surge as the official season winds down, depending on how the season progresses (and how much tropical storm activity contributes to the seasonal total). Note: In what should probably be a running disclaimer for the duration of the monsoon, given the variability and unpredictability of monsoon precipitation, this podcast was recorded prior to the storms that rolled into SW Arizona in the last few days. 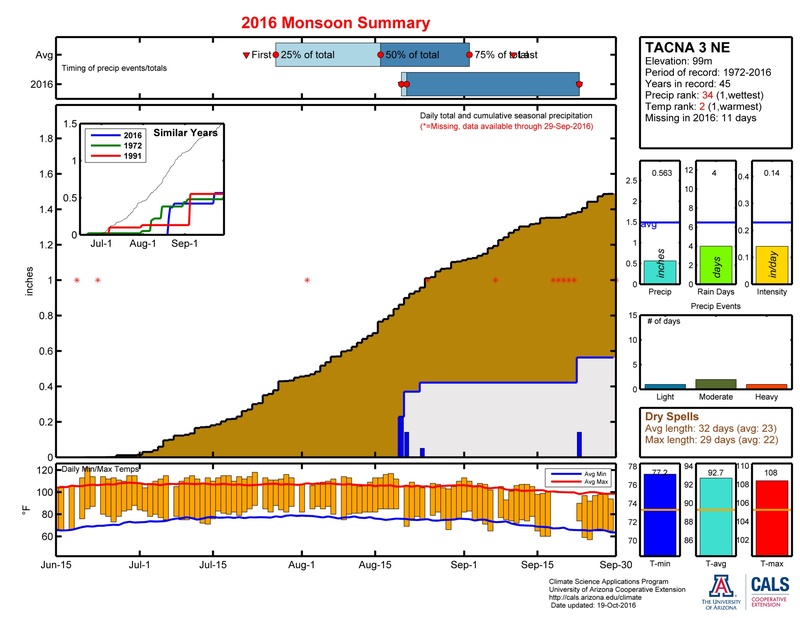 The most salient point is that Tacna is no longer at 0.00 inches for the monsoon (as Mike mentioned in the podcast). As with last month, we'd like to take credit for the uptick in a region we called out, since these storms have a habit of popping up just after we finish recording (see last two months! ), but such is the inherent spatial and temporal variability of the monsoon - if it were easier to track and forecast, it wouldn't be so exciting.